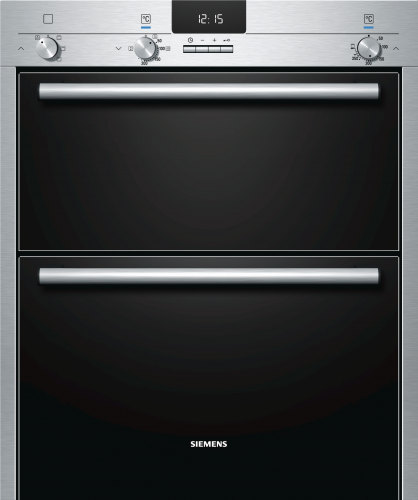 Behold the latest innovation in cooking technology, a stainless steel double oven which goes underneath your worktops. It almost feels unnatural to have an oven in such a position, but the HB13NB521B makes it possible. Sporting a slick metal fascia in stainless steel finish, inter-spliced with a beautiful black glossy surface and high quality control dials. You’ll be hard pressed to find a more attractive design. Further adding to the visual appeal, a bright white display contrasts perfectly with the blacks and icy blue LEDs complete the style. If you’re anything like us, you’ll be all about green energy and saving the planet. We’re using resources far quicker than we should, but let’s do something about it. The EU Energy rating of A goes a long way towards this goal, allowing for a guilt free cooking experience. Perfectionists rejoice, the drop down oven door is flush fitting which is wonderful if we do say so ourselves. A multi function oven in many ways, the HB13NB521B will become the cornerstone of any modern kitchen and being stashed away under the counter means it will do so with complete modesty. Tired of burning food when you aren’t paying attention? This problem is now a thing of the past with Siemens’ innovative clock and timer featuring automatic off technology. © 2019 Silke Kitchens Ltd. All Trademarks Acknowledged. Company Registration No: 09035635. Registered in England and Wales. Registered Address: 217 Dollis Hill Lane, London. NW2 6EX.